KERALA, THE LAND OF AYURVEDA..
Kerala owns a non detachable tradition of Ayurveda that has surpassed the many attacks and intrusions both in land and foreign. For about many centuries the Ayurveda Vaidyas (traditional practitioners of Ayurveda) were almost the only opening for people needs curing from every kind of ailments in Kerala. The mastery over the legacy of eight families of Vaidyas (Ashta vaidyas) and their followers treated the whole state for hundreds of years. Likes the other Indian states, the position of Ayurveda in Kerala is not substitution but mainstream. As a matter of fact, today Kerala is the only State in India which practices this rishi medicinal science with utmost commitment. Being the only sector of treatment or the people, the Vaidyas of Kerala were in task to describe the theories of Ayurveda and adjoin them actively in to fruitful healing systems in everyday life. Thus the majority of the contemporary proceedings and protocols of Ayurveda have enlarged in and around Kerala. 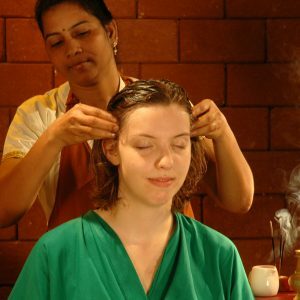 Ayurveda is the soul and essence of Kerala, which has been providing Ayurvedic treatment the traditional way for more than 20 years and has rightfully earned the name ‘The Ayurveda People’. Treatments take place under the supervision of qualified doctors and well-trained therapists in hygienically maintained environs. The herbal garden with more than 600 varieties of herbs provides the ingredients for various Ayurvedic medicines made with due care and diligence at own medicine manufacturing unit. A range of treatments and therapies are offered including basic massages, Pizhichil, Njavarakizhi, Sirodhara, Vasthi, Sirovasthi, Udvarthanam, Abhyangam, Nasyam, Thalam etc. Yoga enhances wellbeing of the body and mind. In addition to having an Ayurvedic experience, enjoying a great holiday in the sunny beach is a special advantage. In simple words, a complete makeover for the body and soul is what this Ayurvedic Resort is all about. And for the keen student of Ayurveda various courses are taught by experts. Ashtangahridayam, the authorized user friendly voracious text of Ayurveda, compiled by the Vagbhatananta is seldom used anywhere in the world as it is vastly done in Kerala. The Vaidyas of Kerala are extra talented in this most ancient treatise of Ayurveda which many scholars prefer an innovation over the prior samhitas of Charaka and Sushruta, the originators of Ayurveda. It is in Kerala that Kashaya Chikitsa (treatment with concoction) has come to be as a ranked protocol including hundreds of Kashayams that were scientifically categorized and organized in accordance with several treatment needs. Keralite Vaidyas were the first to concentrate on the anti oxidant properties of Abhyangam leading to the profusion of Kizhis. The vast volume of Ayurveda colleges and the largest number of practitioners in comparison to any region in the world has led to a tradition of Ayurveda research in a scientific and ideal manner in Kerala.